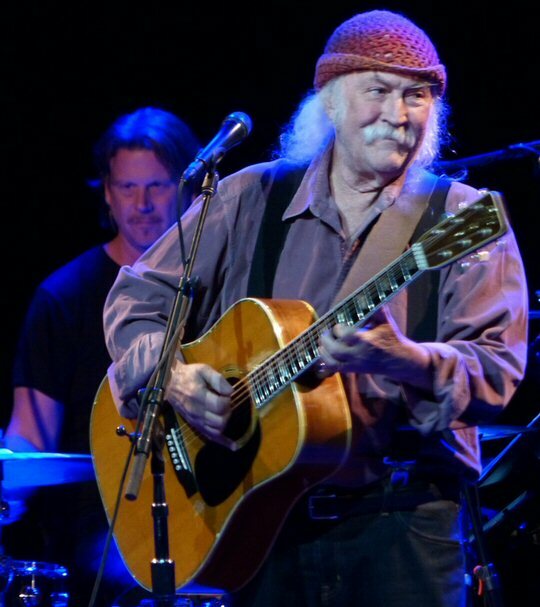 Here's how we began our review the last time we found David Crosby in concert teamed up with his friend, Jeff Pevar - and his son, James Raymond - from well over a decade ago. David Crosby & Friends brought their soothing tunes to Music City. A dense and ominous fog settled in over the Shea Center for Performing Arts on Friday, March 5, 2004. But, by the end of the evening's performance one thing was made clear  David Crosby and CPR were in top form. Unfortunately, by the time they made their way back to their Times Square hotel in New York City another fact was revealed  David Crosby was facing trouble with the law once again  jeopardizing the optimism and exciting news that the band was reporting this night. It turns out that the often notorious performer was arrested that night for criminal possession of a weapon and marijuana found in his luggage in New York City and the show in New Jersey turned out to be one of the last that the remarkable group would play together. Over time fan discussions would turn to the question of what ever happened to CPR and will they ever reunite? Both of these inquiries were pretty much answered to our satisfaction in Nashville. 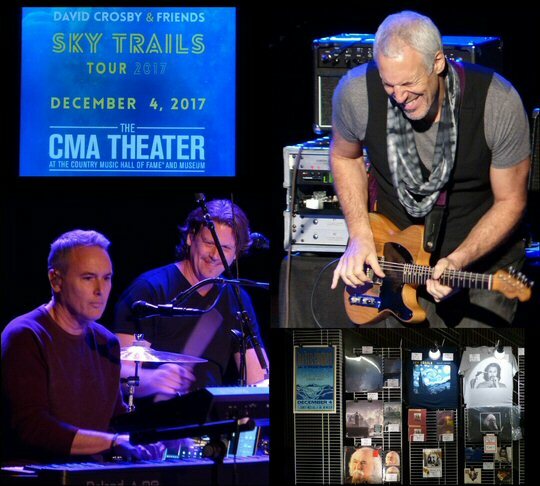 So, while not a proper CPR reunion David Crosby has reformed with James Raymond and Jeff Pevar to tour behind his latest 10-track effort Sky Trails and we caught up with the band called David Crobsy & Friends on December 04, 2017 at the spectacularly high-tech CMA Theater located just upstairs from the Country Music Hall of Fame. The six-piece unit was rounded out with the feminine touch Mai Agan on bass, Michelle Willis on keys, and the in demand Steve DiStanislao on drums. While a lot has changed in the ensuing years much has also stayed the same for the two-time Rock and Roll Hall of Fame Inductee. For example, Crosby relayed to the Music City faithful that his relationship with his long lost son has flourished in the form of a songwriting partnership. Crosby said he has written the most amount of songs altogether with James. The musically gifted Raymond has also become a producer for the rock legend and founding member of The Byrds and CSN&Y. David Crosby - Rock and Roll Hall of Famer plays the CMHOF. James Raymond, however, appeared to be the most pensive performer of the night and his creative input in the form of vocals was lessened from the CPR days. The singing was explained by D.C. the music director when he introduced Willis describing how much easier it is to hit the high parts when you have a woman in the band. When Raymond's cell phone went off mid-set Crosby cautioned that he was in for "100 miles of torture". Who knows, maybe James was worried about the horrific fires that were barreling down on the Hollywood Hills. Can't blame him, if so. Of course, that region of the country is also known for launching the famous Southern California 70's sound that David was a major part of. Nevertheless, the sextet were on fire as they simmered and smoked through two sets in Music City. The first half was heavy on CPR reprisals including the explorative and insightful "Morrison" and the tune David called his favorite from those days "At the Edge". Of that group Crosby explained that the reason they went away was really due to a lack of record sales. Crosby was warm and witty throughout the evening. But, when a gentleman seated up front starting playing with his cell phone David chastised him from the stage. He also didn't hold back on holding the military industrial complex responsible for the death of President John F. Kennedy in 1963. The laid back legend took the night in his stride with humor as when he explained he probably should stayed with The Byrds a little longer. Highlights from the second set were the title track "Sky Trails" that Crosby revealed was about finding direction. "Delta" from the late career smash Daylight Again was mesmerizing. Despite everything going on in the country today David sang a portion of the patriotic "My Country, 'Tis of Thee" before playing one of two hippie anthems. "Wooden Ships" found the band collectively sailing with a full sound and jamming along with the always potent Pevar who's as good of a first mate there is when it comes to bringing guitar chops on board. "We don't have an encore, but we know where to borrow one," said the Cros who was still feeling feisty and protesting for another day and age in America. "Ohio" by Crosby, Stills, Nash & Young put a rockin' explanation point on a night that found Crosby and his friends sounding so good. The only bummer, this tour was winding down with only a few dates remaining after their stay in NashVegas. Still, we can't wait to see what the next flight from the historic and trail-blazing classic rocker will bring. More scenes from David Crosby & Friends in Nashville.